This month's edition of Humanoids of Surly features Jack Mac. Jack hails from wherever his VW T3 Synchro van is parked at the moment. In tow, he has an ECR, Instigator, and Karate Monkey for his various expeditions. 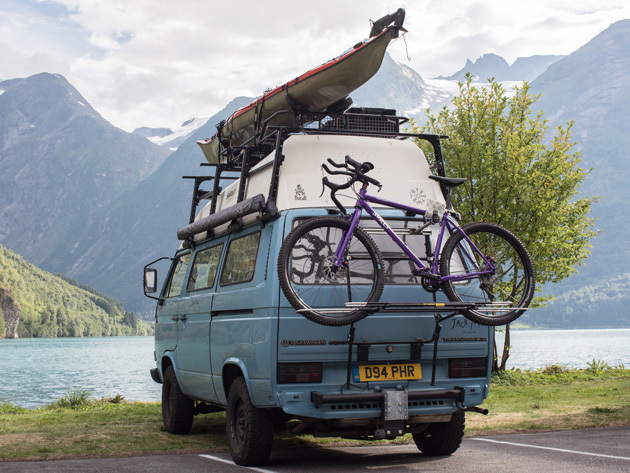 I’ve lived in an expedition spec VW T3 Syncro ( or Vanagon for those of you across the pond ) for the past three years...so I live everywhere and anywhere. The long-term plan is to take the van round the world, but I’ll need to be a mechanical guru before I do that! + I’ll never have any financial stability. + Say good-bye to an early retirement. + Good luck finding someone who’ll employ you. + You must be really dirty. Obviously, I don’t rise to their insults as an English gentleman and instead hit them with the facts....screaming: ‘ yeaaaah well what are you going to do when the zombie apocalypse takes over and the political, economic and social structures of planet earth collapse....huh!!! ‘ ( *through crazy man eyes and dribbling..... ) ‘ don’t be knockin at my van door when you need to locking-diff your way through the hordes of the undead...’. Some people say I’m a crazy man who should seek professional rehabilitation....but I ate them....with some baked beans and hot sauce...because Fava beans and Chianti is way beyond my cooking abilities. I feel that covers location nicely. My name is Jack Mac, 27 years old, and I’m an expedition photographer, videographer and writer living full time on the road in a expedition rig....well I mean that’s what I put on the ole C.V....another way to put it, or perhaps how everyone other than myself would describe me is...ahum: weird goblin like freak with no job prospects, a prospective retirement age of 98, lives in van to escape crippling cost of rent, will probably die alone crying and hopes for the zombie apocalypse ( the abolition of the entire human race is about the only way I’ll be accepted back into society )...but who cares what the majority think!?! shredding trails I kayak, powerlift, run, hike, climb, swim and generally do as much stuff outside as possible. If this doesn’t already sound like a cringy dating profile it’s worth adding that I love films ( particularly Lord of the Rings...oh yeaaaah now I’ve got the laddddies attention ) and learning ( I actually got offered a scholarship at Cambridge University for a thesis I wrote on Roman Masculinity but don’t like to talk about it...seriously stopppp it....no big deal ). So...can I meet your parents yet?! If you play your cards right I may even dress as Gandalf and let you can take me home....nothing sexual, I just need a shower and some food...I live in a van for god sake. ( to this day I’ve never even tried a cigarette....probably from smokin’ dat Satya Sai Baba Nag Champa Joss Stick...hit the hard stuff first ). After spending the next ten years in rehab I was released back into society and decided bikes were the best way to stay on the straight and narrow ( the words of my psychiatrist from Arkham Asylum ringed in my ears: ‘ seriously jack stop trying to smoke Joss sticks...’ . The day I finished uni I did my first longer tour through Europe and I can pretty much thank that adventure for crippling debt ever since.....a new film ‘ Get broke or die tryin’ Joss sticks ’ is set to be released soon. 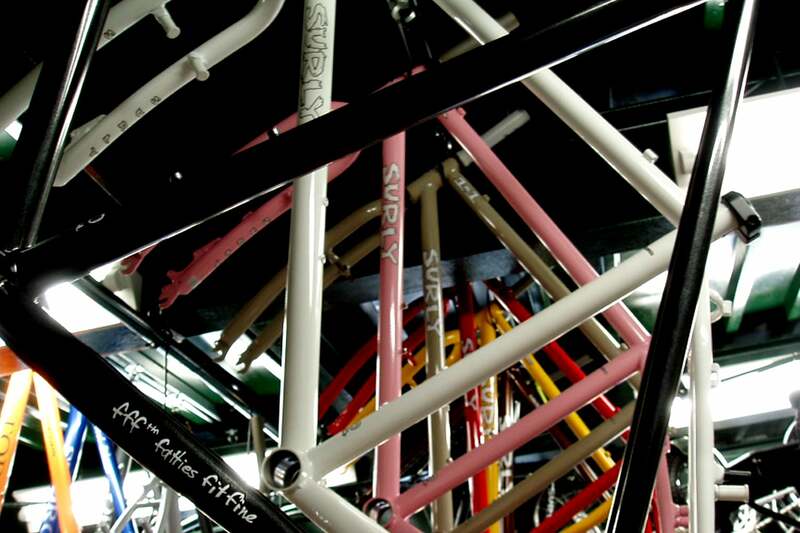 Tell us about your Surly? I thought you’d never ask. Well, I have three Surly bikes: The ECR, Instigator and new custom build Karate Monkey SS. You’re probably thinking ‘ oh hellllllo trust fund !!! ’...well my parents wouldn’t trust me with a bag of crisps let alone any considerable amount of money, which is fortunate as we put the ‘ working ’ in class. Instead I reinvest every penny I earn into adventure and this includes my bikes. The ECR was the first Surly I purchased and has a special place in my heart....brace yourselves...and prepare to submerge into a DMC ( ‘ deep meaningful ’ conversation for those of you real men who drink beer and eat Jerky ). bike. The weight of the world was lifted from my shoulders as I realised I’d already made it, that I had my health, time and a machine that epitomized the purest sense of adventure. Well, the worst thing about Surly products is they’re so damn good....it’s not long before you get that Minnesota itch for more steel....so I bought the Instigator. 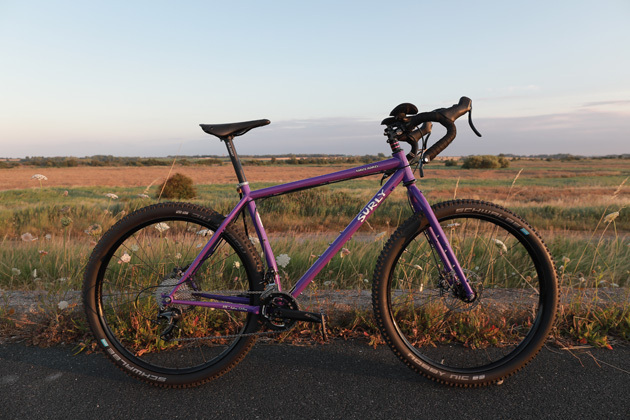 It’s hard to talk favourites when it comes to my Surly bikes as they each serve a different purpose and the Instigator has been one of the most versatile bikes I’ve ever owned. At 6’3 I’m fairly tall and the XXL ECR is an absolute beast ( the huge proportions is what makes it so exciting to ride ) but the dimensions are not the most practical of my steeds for life on the road ( especially as I often keep the bike inside for security ). I also wanted something for fast pace forest singletrack and the Instigator ticked all the boxes. I have the largest size frame but it still packs down nice and compact ( particularly thanks to its 26” wheels ) and its become my go to rig for life on the road when space is at a premium. The Instigator is certainly a woodland hooligan; made for thrashing around trails at a speed that’s always close to going to the hospital ( I have a puncture wound in my leg to prove it...). However, I’ve also used this bike for countless bikepacking rides and its always performed flawlessly. The riding position is super comfortable and the front sus can be a real treat on unforgiving rocky singletrack. So what about the Surly Karate Monkey SS? Well, the Karate Monkey marks the next chapter in my bikepacking journey. This is the bike that asks me to be better. A machine that takes me hundreds of miles outside my comfort zone before the ride even starts. I’m currently enroute to bikepack some of the national parks in Norway and consider this just a taster session for the Monkey. This is a bike designed carefully to endure the toughest mountain singletrack, whilst also being able to cover big distances on gravel/tarmac. Stay tuned. This is an extremely difficult question to answer. 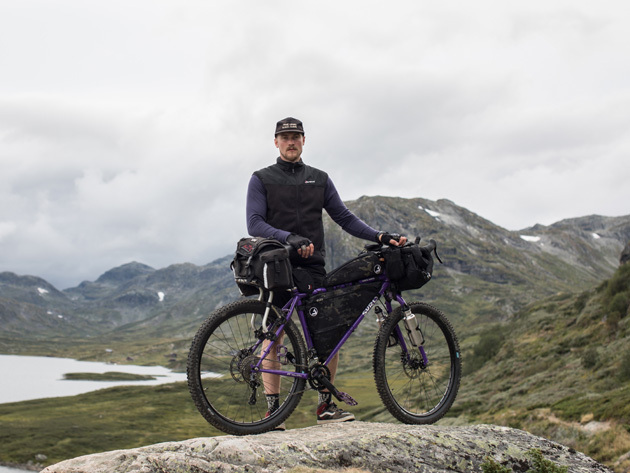 Bikepacking has been such a hugely positive part of my life for the last decade. However, there is one memory that not only stands out as a favourite, but also as the most important. On occasion my dad ( my biggest hero ) would wake me up at midnight when I was super little and take me on a night ride to a local roman fort along the coast. Hot chocolate and snacks were compulsory, not to mention packing a number of important toys and we’d spend the night watching the stars. My dad’s love for adventures, big and small, taught me that exploration does not have to be exclusive. That the most meaningful experiences in life cost nothing and the great outdoors is for everyone. This sentiment has probably been the greatest factor in both my physical & mental health growing up, when the chips are down nature’s always there for you. Another bloody difficult one to answer....seriously Surly?! I wouldn’t be surprised if the next question was ‘ one of your closest friends has to die...but who!? ’. That said, I have an answer, it’s Briggs ( a.k.a Mr Toad ) that guy takes great pleasure in telling me how many awful farts he forced into the van’s upholstery on road trips...I mean...sorry...the Himalayas. I think this mountain range is one of, if not the, most beautiful in the world and a location that in many ways defines human endurance. Thus, the prospect of taking on such a truly brutal ride in some of the most beautiful landscapes on Planet Earth is the absolute dream and one that might be realised next year....but shhhh don’t tell anyone...or that I got offered a scholarship at Cambridge for understanding the complexities of masculinity during the transition from Paganism to Christianity in the third century Roman Empire...seriously shhh...I don’t want to talk about it!